I don’t know about you, but I have a bit of a love/hate relationship with granola bars. They’re just so darn easy to grab in the morning when you’re already 15 minutes late for school/work, but at the same time, most of them are basically candy. I’ve gone through different phases and brands over the years, starting in high school with those break-your-teeth-crunchy Nature Valley bars, which I used to devour after tennis practice. 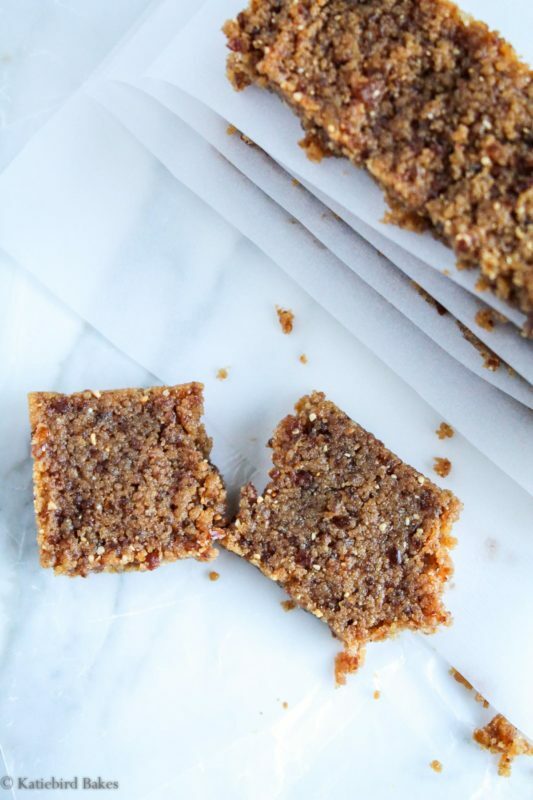 So tasty – but also, so very hard to eat without crumbles all down your shirt. Then in college it was Fiber One, Special K, and those Quaker Oatmeal Cookie Bars (anyone else remember those??) on my way to class. In law school, I moved on to more “natural” options like Luna bars, KIND bars, and Larabars. 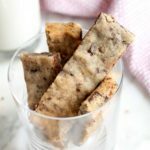 Yet even when I was eating those healthier bars, I couldn’t shake the feeling that I could probably make these myself, and they would actually be healthier/taste better/be cheaper. 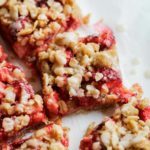 Then a couple Christmases back, my parents gave me the Power Hungry cookbook, full of copycat recipes for all my favorite protein and granola bars. Once I got a large food processor as a wedding gift (this one), things really started rolling. I am loving making my own bars, and Brian loves them too! 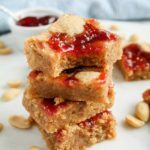 This is a copycat of the Larabar “Cashew Cookie” flavor adapted from that cookbook, and it couldn’t be easier to make. If you look at their label, it just says “dates and cashews” as the ingredients. I decided to use them in equal proportions, and add vanilla extract and a bit of sea salt for that extra cookie flavor. You can also add a scoop of vanilla protein powder if you want an extra protein punch. Totally optional – you do you. Start with your ingredients all together in the food processor, making sure you soaked the dates in warm water for a few minutes first until they are soft. If your dates are a little older, you might have to leave them in the water for longer to make sure they’ll process well. If they’re fresh, don’t leave them in long or they’ll disintegrate! 5 minutes will do. Blitz them for a minute or so in the food processor, then scrape down the sides, and process again for another minute or two until everything is fully combined, as above. Isn’t it amazing how this texture already looks like granola bars? If you’re adding protein powder, add now and process again for another minute or so until everything is incorporated (I used Trader Joe’s Vanilla Whey Protein Powder). Now, scrape it all out into a wax paper-lined loaf pan (I used this 9×5 inch loaf pan), and smooth it out evenly so it’s tightly packed down. Refrigerate for a half hour, or if you’re super impatient like me, put it in the freezer for 10 minutes. Then pull the wax paper out of the pan, and cut evenly into 6 bars. There you have it. Soft, chewy, and naturally sweet. Isn’t it amazing how sweet dates are? I love their deep caramel-like flavor. I can’t believe I only started eating them a couple of years ago! 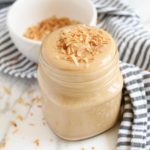 They’re seriously delicious and can be blended with so many things. 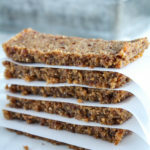 I’ve got lots of ideas percolating now for other protein bars to make with them. 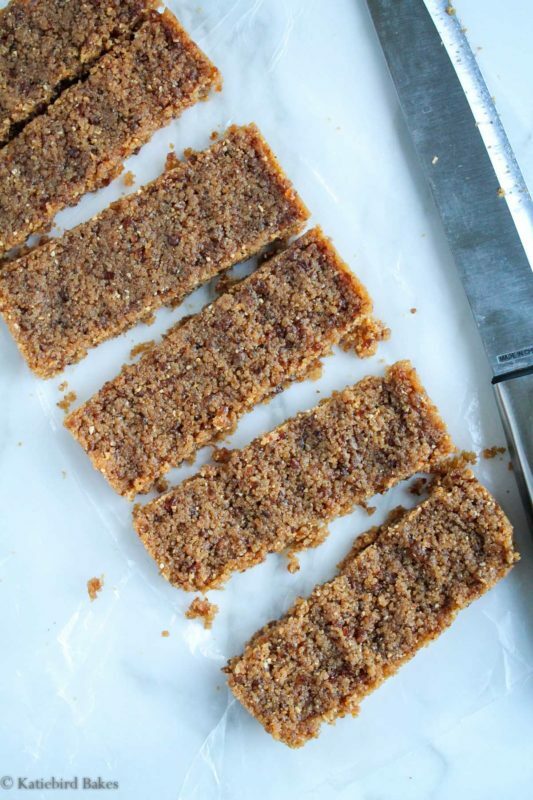 The great thing about these bars is they will keep at room temperature for up to 3 days. So you can wrap them individually in plastic wrap and take them on a weekend trip for snacking, or bring them to work and keep them in your desk drawer to fight the 3 p.m. hanger. They’ll also keep in the fridge and freezer for much longer than that. Who needs to pay $2 per bar anymore? 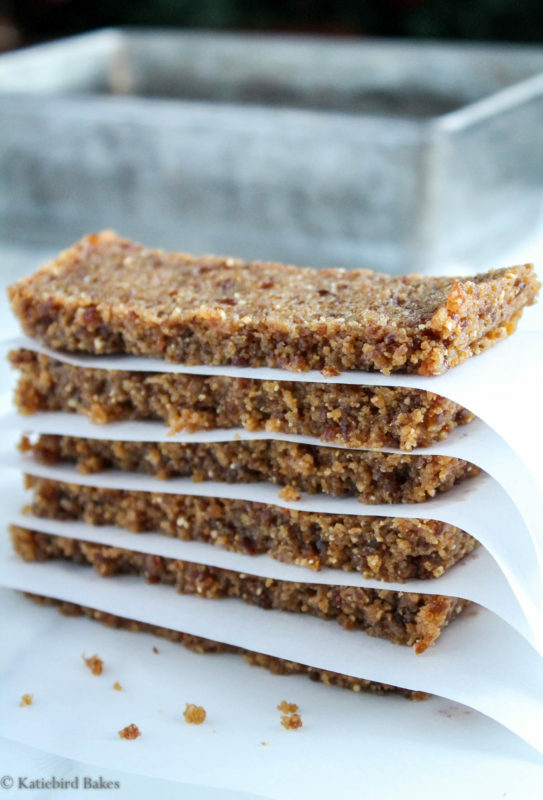 Simple 4-ingredient homemade protein bars that are naturally sweetened with dates! 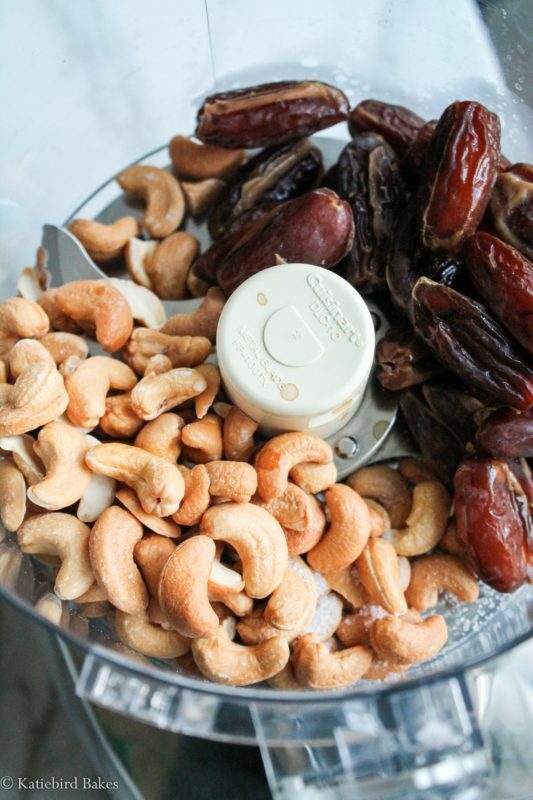 Put the dates in a small bowl and cover with warm water to soften for about 5 minutes. If your dates are older, they may need a few more minutes before they are soft. They should be pliable so they are easy to process. Put the nuts in the bowl of a food processor and pulse until they are finely chopped, but not a paste, about 1 minute. Add the rest of the ingredients to the bowl of the food processor and process continuously for about 30 seconds. Stop and scrape down the bowl, then process again until everything is well-combined. It may ball up, and that's ok.
Line a 9x5 inch loaf pan with wax paper. 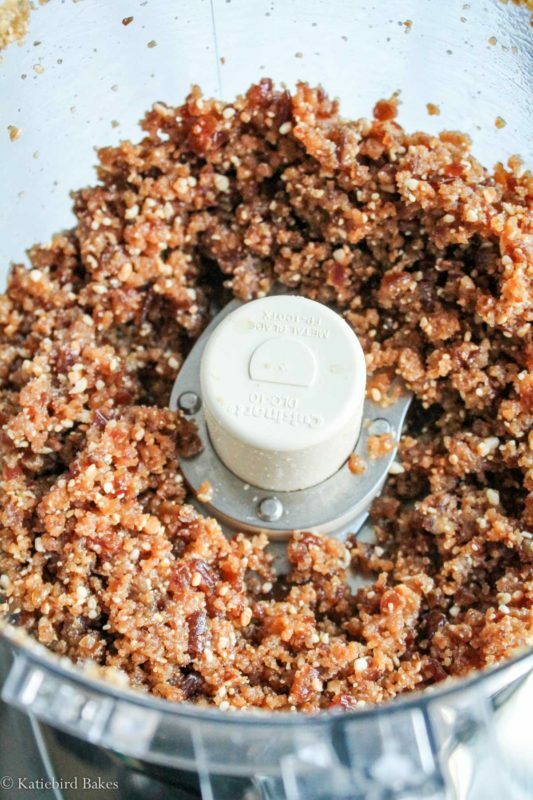 Scrape the mixture into the pan and press down evenly. Chill in the fridge for an hour, or in the freezer (if you're impatient like me) for 10-15 minutes. 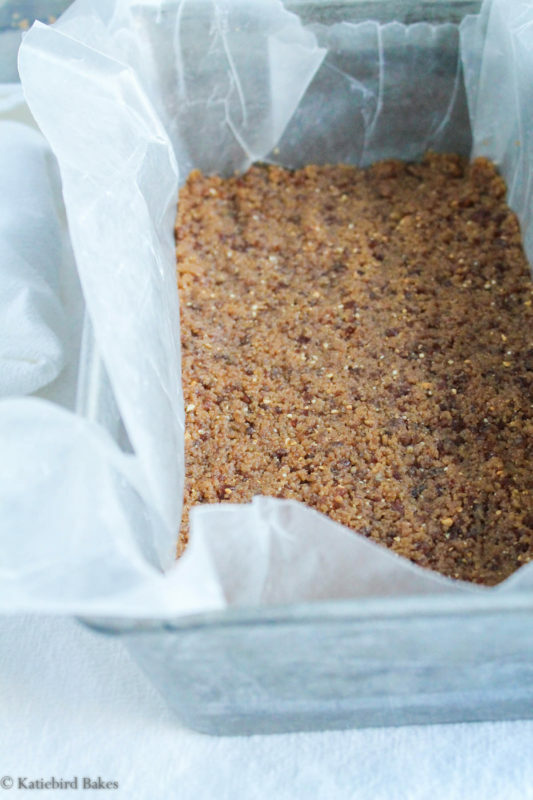 Remove the wax paper from the loaf pan and cut the mixture evenly into 6 granola-bar-sized bars. Store, wrapped individually in plastic wrap, at room temperature for up to 3 days, fridge for up to 2 weeks, or freezer indefinitely. If storing in freezer, thaw before eating. Adapted from Power Hungry by Camilla Saulsbury.